Rugby league football, usually called rugby league, or simply league is a full contact sport played by two teams of thirteen players on a rectangular field. One of the two codes of rugby football, it originated in England in 1895 as a split from the Rugby Football Union over the issue of payments to players. Its rules gradually changed with the purpose of producing a faster, more entertaining game for spectators. 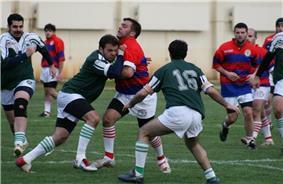 It is frequently cited as the toughest, most physically demanding of team sports. In rugby league points are scored by carrying or kicking the ball down the field, until it can be moved past the opponents' designated goal line and touched to the ground; this is called a try, and is the primary method of scoring. The opposing team attempts to stop the attacking side gaining points by preventing their progress up the field by tackling the player carrying the ball. In addition to tries, points can be scored by kicking goals. 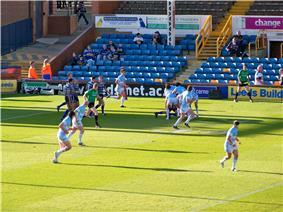 After each try, the scoring team gains a free kick to try at goal with a conversion for further points. Kicks at goal may also be awarded for penalties, and field goals can be attempted at any time during general play. Rugby league is among the most popular sports in Northern England, Australia, New Zealand, France, Tonga and Papua New Guinea, where it is the national sport. The European Super League and Australasian National Rugby League (NRL) are the premier club competitions. Rugby league is played internationally, predominantly by European, Australasian and Pacific countries, and is governed by the Rugby League International Federation. 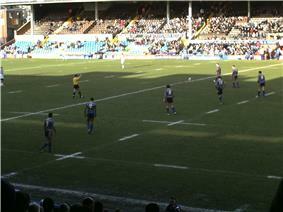 The first Rugby League World Cup was held in France in 1954; the current holders are Australia. The first of these, the leagues" and introducing Northern Union rules. In 1922, the Northern Union also changed its name to the Rugby Football League and thus over time the sport itself became known as "rugby league" football. In 1895, a  Within fifteen years of that first meeting in Huddersfield, more than 200 RFU clubs had left to join the rugby revolution. Andrews, Malcolm (1981). Rugby league, the greatest game of all. Horwitz. Andrews, Malcolm (1995). The A-Z of Rugby League. Hodder Moa Beckett. RLIF (2004). "The International Laws of the Game and Notes on the Laws". Rugby League International Federation. Archived from the original on 2010-01-05. Retrieved 30 July 2008. Bellew, T. J. (1984). Laws of the game of rugby league football. Paul Downward and Ian Jackson (2004). Common Origins, Common Future? A Comparative Analysis of Association Football and Rugby League Football in the UK. Greenwood Publishing Group. ^ Scianitti, Matthew (18 June 2011). "The world awaits for Canada's rugby team". ^ newzealandnow.govt.nz. "Sports". Life in New Zealand. ^ Middleton, David (March 2008). League of Legends: 100 Years of Rugby League in Australia. National Museum of Australia. p. 27. Olson, Lisa (1997-09-28). "The down under thunder before Dodgers Rupe shook up Aussie sport". Whitley, David (16 November 1999). "The Toughest Sport On Earth". "My Life in Rugby League: Joe Vagana – Bradford Bulls". League Express. League Publications Ltd. 2008-04-07. Retrieved 27 May 2009. ^ Else, David (2009). England. ^ "Rugby league: National Rugby League and Australian Rugby League". hreoc.gov.au. Australian Human Rights Commission. Retrieved 11 August 2012. ^ Nicola Williams, Oliver Berry, Steve Fallon (2009). France. Lonely Planet. p. 54. ^ Spracklen, Karl (2001). 'Black Pearl, Black Diamonds' Exploring racial identities in rugby league. Routledge. p. 72. ^ Groeneveld, Margaret (2007). Matters of the heart: The business of English rugby league. Berghahn Books. p. 27. ^ a b Baker, Andrew (1995-08-20). "100 years of rugby league: From the great divide to the Super era". ^ Jupp, James (2001). The Australian People: An Encyclopedia of the Nation, Its People and Their Origins. Cambridge University Press. pp. 342 & 343. ^ Collins, Tony (2006-04-18). Rugby League in Twentieth Century Britain (1 ed.). Routledge. pp. 113–114. ^ RLIF Rankings. Rlif.com. Retrieved 20 August 2013. ^ norskrl.com. norskrl.com. Retrieved 20 August 2013. The early 21st century has seen take up the game and compete in international rugby league with efforts being made by the Rugby League European Federation to expand the game to new areas such as Germany, Sweden, Norway and Hungary. Rugby league is played in over 30 nations throughout the world, 27 are ranked by the RLIF and a further 11 are unranked. The strongest rugby league nations are Australia, England and New Zealand. The Rugby League World Cup is the highest form of representative rugby league and currently features 14 teams (ordered by RLIF rank) (1) Australia, (2) New Zealand, (3) England, (4) France, (5) Fiji, (6) Wales,(7) Papua New Guinea,(8) Samoa, (9) Ireland, (10) USA, (11) Scotland, (12) Italy (13) Tonga, and (14) Cook Islands. (20) Lebanon, (15) Russia and (25) South Africa have previously contested in World Cups. The current World Champions are Australia, who won the 2013 Rugby League World Cup. Players on the field are divided into forwards and backs, although the game's rules apply to all players the same way. Each position has a designated number to identify himself from other players. These numbers help to identify which position a person is playing. The system of numbering players is different depending on which country the match is played in. In Australia and New Zealand, each player is usually given a number corresponding to their playing position on the field. However, since 1996 European teams have been able to grant players specific squad numbers, which they keep in irrelevance to the position they play, similarly to association football.